Does the 21st century belong to the Asian nations? Time only will tell, but there is little doubt that the world's only superpower -- the United States of America -- is indeed in deep trouble. Not only is the American economy shaky, its preeminent position in other fields too is slipping away. According to a report jointly compiled by The Boston Consulting Group, the Washington-based National Association of Manufacturers, and The Manufacturing Institute, the NAM's nonpartisan research affiliate, the US is no more the top destination for innovation despite its world-renowned universities and venture capital funds. Unfortunately India, too, has little to cheer about. While Silicon Valley boasts of innumerable 'Indian start-ups', India itself ranks way below at 46 in a list of 110 most innovative countries. China, ranked 27, also fails to make it to the top ten. 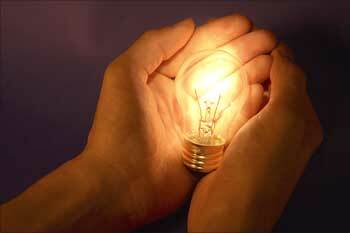 The study measured both innovation inputs and outputs. Innovation inputs included government and fiscal policy, education policy and the innovation environment. Outputs included patents, technology transfer, and other R&D results; business performance, such as labour productivity and total shareholder returns; and the impact of innovation on business migration and economic growth. It has a highly developed and successful free-market economy. It enjoys a remarkably open and corruption-free environment, stable prices, and a per capita GDP higher than that of most developed countries. Singapore also is the world's most innovative nation. Real GDP growth averaged 7 per cent between 2004 and 2007, but dropped to 1.2 per cent in 2008 as a result of the global financial crisis. Industries: Electronics, chemicals, financial services, oil drilling equipment, petroleum refining, rubber processing and rubber products, processed food and beverages, ship repair, offshore platform construction and life sciences. Note: All figures in this and subsequesnt slides are that of 2008, unless otherwise mentioned. Sources: CIA, The World Factbook; World Bank and IMF. 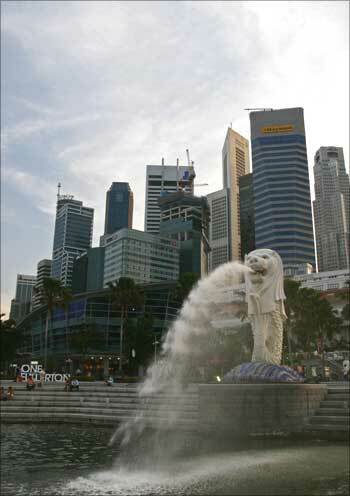 Image: People sit on the steps near the Merlion, in Singapore's financial district. In 2004, South Korea -- the world's second most innovative nation, according to the study, joined the trillion-dollar club of world economies. In 2008, its GDP per capita was roughly the same as that of the Czech Republic and New Zealand. Korea was hit hard by the global financial turmoil that began in September 2008. Stock prices fell by more than 40 per cent for the year and the value of the won (Korean currency) fell by approximately 26 per cent. Industries: Electronics, telecommunications, automobile production, chemicals, shipbuilding, and steel. 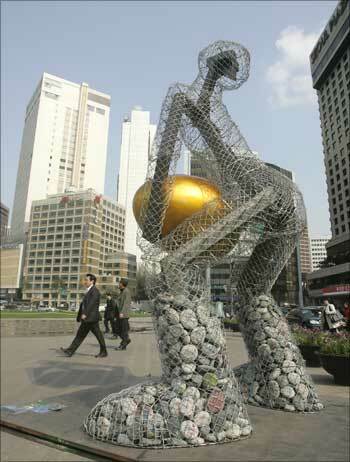 Image: People walk past a statue titled 'Seoul broods a golden egg' at the Seoul city hall plaza in central Seoul, South Korea. It is a peaceful, prosperous, and stable modern market economy with low unemployment, a highly skilled labor force, and a per capita GDP among the highest in the world. It is also the third most innovative nation in the world. Switzerland's largest banks suffered significant losses in 2008 and the country's largest bank accepted a government rescue deal in late 2008. The Swiss National Bank, beginning in October 2008, cut interest rates on several consecutive occasions, effectively instituting a zero-rate policy in a bid to boost the economy. Industries: Machinery, chemicals, watches, textiles, precision instruments, tourism, banking, and insurance. 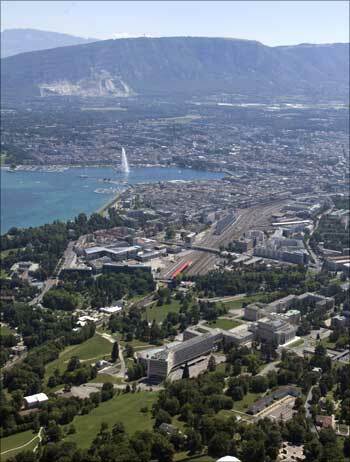 Image: The city of Geneva, Switzerland. Iceland is the 4th most innovative nation. Its economy combines a capitalist structure and free-market principles with an extensive welfare system, including generous housing subsidies. Prior to the 2008 crisis, Iceland had achieved high growth, low unemployment, and a remarkably even distribution of income. The foreign exposure of Icelandic banks, whose loans and other assets totaled more than 10 times the country's GDP, became unsustainable. Iceland's three largest banks collapsed in late 2008. The country negotiated over $10 billion in loans from the IMF and other countries to stabilize its currency and financial sector, and to guarantee foreign deposits in Icelandic banks. Iceland's coalition government collapsed in January 2009 following protests over growing joblessness and losses to personal savings. Industries: Fish processing; aluminum smelting, ferrosilicon production; geothermal power and tourism. Reserves of foreign exchange and gold: $2.5 billion. 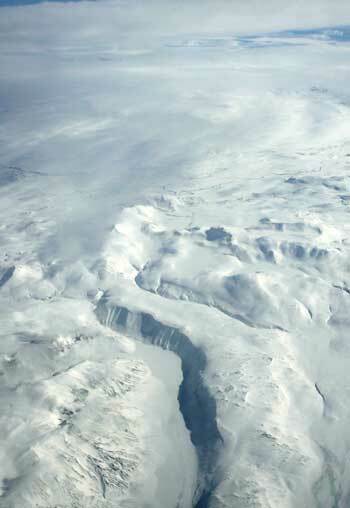 Image: An aerial picture shows part of Europe's biggest glacier Vatnajokull, in south-eastern Iceland. Ireland, the fifth most innovative country, is a small, modern, trade-dependent economy. GDP growth averaged 6 per cent in 1995-2007, but economic activity dropped sharply in 2008 and Ireland entered into a recession for the first time in more than a decade with the onset of the world financial crisis. Agriculture, once the most important sector, is now dwarfed by industry and services. The Irish government has implemented a series of national economic programs designed to curb price and wage inflation, invest in infrastructure, increase labour force skills, and promote foreign investment. Ireland joined in circulating the euro on January 1, 2002 along with 11 other European Union nations. Industries: Steel, lead, zinc, silver, aluminum, barite, and gypsum mining processing; food products, brewing, textiles, clothing; chemicals, pharmaceuticals; machinery, rail transportation equipment; glass and crystal; software and tourism. Reserves of foreign exchange and gold: $926.2 million. 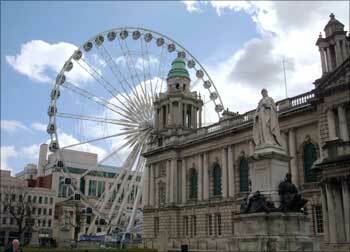 Image: A 60-metre high Ferris stands close to Belfast's City Hall in Northern Ireland. It has a free market economy highly dependent on international trade and finance, which has left it heavily exposed to the global economic slowdown that began in 2008. The territory has become increasingly integrated with mainland China over the past few years through trade, tourism, and financial links. The mainland has long been Hong Kong's largest trading partner, accounting for nearly 49 per cent of Hong Kong's exports trade by value in 2008. GDP growth averaged a strong 5 per cent from 1989 to 2007, but the global financial crisis caused a sharp slowdown in the second half of 2008, pushing the territory into recession. Hong Kong, the 6th most innovative nation, continues to link its currency closely to the US dollar, maintaining an arrangement established in 1983. Industries: Textiles, clothing, tourism, banking, shipping, electronics, plastics, toys, watches and clocks. Reserves of foreign exchange and gold: $165.9 billion. 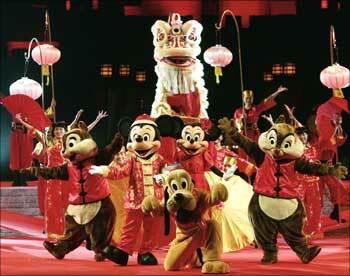 Image: Disney's cartoon characters perform with lion dancers at Hong Kong Disneyland. It has a highly industrialised, largely free-market economy with per capita output roughly that of the United Kingdom, France, Germany, and Italy. Although Finland has been one of the best performing economies within the EU in recent years and its banks and financial markets have avoided the worst of global financial crisis, the world slowdown has hit export growth and domestic demand. Industries: Metals and metal products, electronics, machinery and scientific instruments, shipbuilding, pulp and paper, foodstuffs, chemicals, textiles and clothing. Reserves of foreign exchange and gold: $9.3 billion. 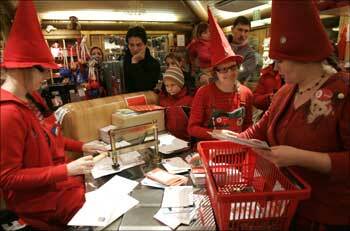 Image: People dressed as elves post mark letters with the stamp from Santa Claus' Post Office on the Arctic Circle near Rovaniemi, northern Finland. The US has the largest and most technologically powerful economy in the world, with a per capita GDP of $48,000. The global economic downturn, the sub-prime mortgage crisis, investment bank failures, falling home prices, and tight credit pushed the United States into a recession by mid-2008. To help stabilise financial markets, the US Congress established a $700 billion Troubled Asset Relief Program in October 2008. The government used some of these funds to purchase equity in US banks and other industrial corporations. In January 2009 the US Congress passed and President Barack Obama signed a Bill providing an additional $787 billion fiscal stimulus - two-thirds on additional spending and one-third on tax cuts - to create jobs and to help the economy recover. 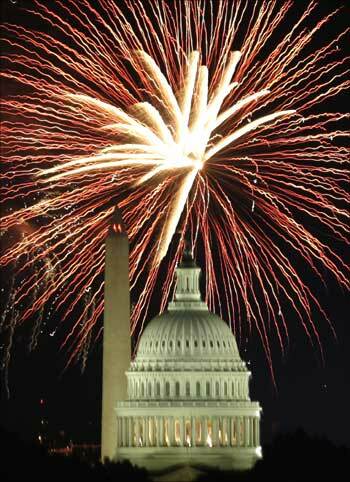 Image: Fireworks explode over the United States Capitol dome and Washington Monument on Independence Day. In the years following World War II, government-industry cooperation, a strong work ethic, mastery of high technology, and a comparatively small defense allocation (1 per cent of GDP) helped Japan advance with extraordinary speed to the rank of second most technologically powerful economy in the world after the US. Today, measured on a purchasing power parity (PPP) basis, Japan is the third-largest economy in the world after the US and China. Japan's huge government debt, which totals 170 per cent of GDP, and the aging of the population are two major long-run problems. Industries: Among world's largest and technologically advanced producers of motor vehicles, electronic equipment, machine tools, steel and nonferrous metals, ships, chemicals, textiles and processed foods. 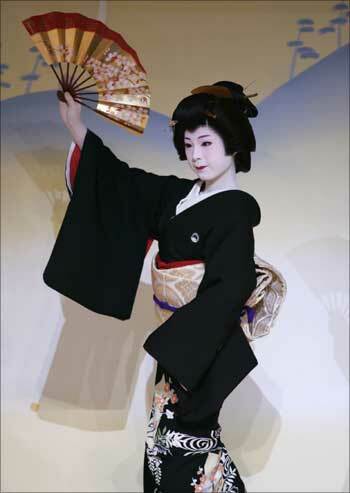 Image: A geisha performs at the Kaburenjo theatre in the Miyagawa district of Kyoto, Japan. It has a modern distribution system, excellent internal and external communications, and a skilled labour force. It is the 10th most innovative country, according to the study. Despite strong finances and underlying fundamentals, the Swedish economy slid into recession in the third quarter of 2008 and growth continued downward in the fourth as deteriorating global conditions reduced export demand and consumption. 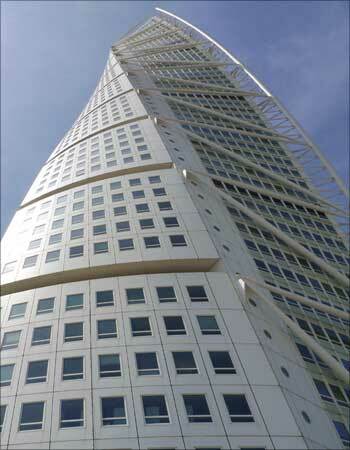 On February 3, 2009, the Swedish government announced a $6 billon rescue package for the banking sector. Industries: Iron and steel, precision equipment (bearings, radio and telephone parts, armaments), wood pulp and paper products, processed foods and motor vehicles. Reserves of foreign exchange and gold: $31.04 billion.